The pattern I purchased comes in the following size range: 32A-D; 34A-D; 36A-DD; 38B-DD; 40B-DD; 42B-DD. I also mentioned in my last post that I’m a 30E. The cup is ultimately easier to alter than the band so the first part of alteration process, I focused on the cups.. because after all the cups are what encapsulate the breast, and that’s really what a bra is about. I’m using this particular section just based on the relevancy to my own size. As you can see, the cup volume of a 30E bra is 590cc, or 2.49 cups, and then the cup volume of a bra that’s 32D is 480cc, or 2.02 cups. That’s nearly a 1/2 cup difference! The pattern unfortunately did not go to a 32DD (which would have made my life easier) so I move up a band on the 590cc line; the next cup size is a 34D; great! I found a sister size that will work! I could have cut the pieces I need from the 34D sizes, but then I would have had to make even MORE adjustments; I felt that it would be easier to alter the cup to fit in the band, and then alter the band just one size down, versus leaving the cups alone and trying to alter the band two sizes down; that creates a greater margin of error. I feel that it’s important to note that if you’re purchasing a bra off the rack, it’s important to try and find your actual size, versus settling for a sister size. If you have to settle, then by all means; it’s not the end of the world but you may find you need to make adjustments! I would also recommend only going up a band size; going down may not work due to the band being so tight that you may not be able to close it; and if you manage to close it you may end up in pain. However, this is not true if you go into the larger band range; bands around and above 38 tend to be stretchier, and you may be able to go down a sister size if that’s the case. 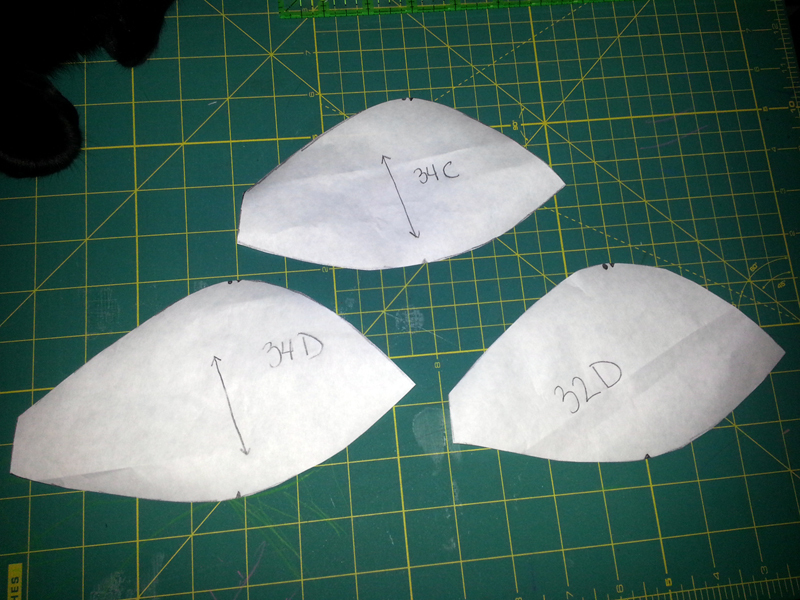 Here are the bottom cup pieces for the 32D, 34C and 34D bras. And the black in the upper left corner is part of my cat Vos. I cut out three pieces for the purpose of this post; I’ll get to the alterations in a second. In the chart above you’ll note that 32D and 34C sit on the same line on the sister sizing chart. It’s easy to assume they are cut the exact same way; when in reality they are not. 32D versus 34C. I did my best to line the cups up on the line but was a bit off. one large square is an inch. Anyway, while I didn’t line the pieces up perfectly; let’s take a look at their differences. First off, the length from left to right in the picture isn’t exactly the same. I wish I had lined it up more accurately but I didn’t. The next thing to note is the difference in height. From the bottom to the top, the 34C cup is almost, if not exactly 4″. the 32D on the other hand is about a quarter of an inch taller. 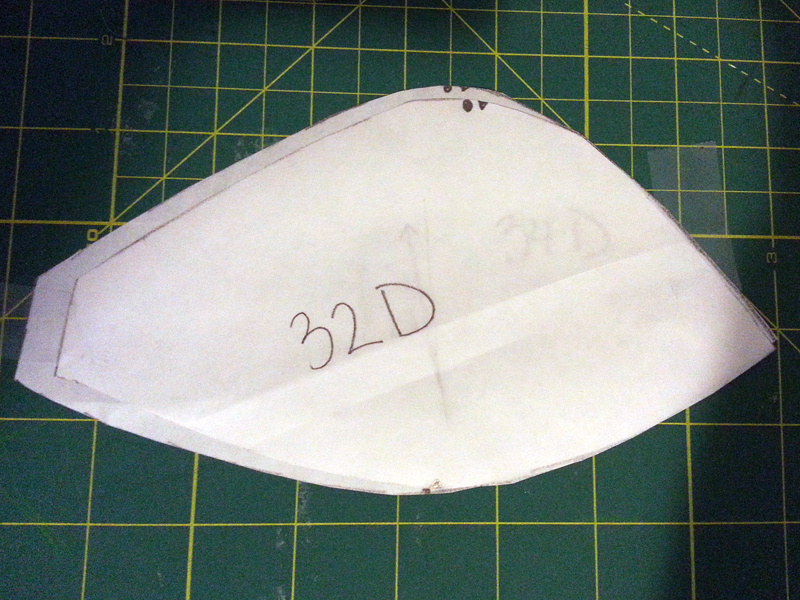 You can also sort of see that the left seam that’s flat is wider on the 34C than it is on the 32D. Additionally the angles on the right half up the cups are different as well. I won’t get into the geometry too deeply because I know math makes most people go cross-eyed, but the pointy tip is just a hair over 2″ taller than the bottom most part of the pattern piece of the 34C, and on the 32D cup; the point is nearly 2.5″ above the bottom of the cup. This is a clear indication that the angle is different in a 34 band versus a 32 band; the difference in the slope and angles is a means to allow a shift in distribution while maintaining the needed consistency of the volume. This is why when you measure at a specific size, and the wires are too narrow, it’s important to stay in your volumetric range in order to get more comfortable wires you may need to move over on the sister size chart. In my opinion, if you have to move over more than one cup/band size, you may need to consider buying another brand of bras altogether; bra companies typically do not all use the same style/sized wires for the same size. So on to the alterations! 32D piece on top of 34D. 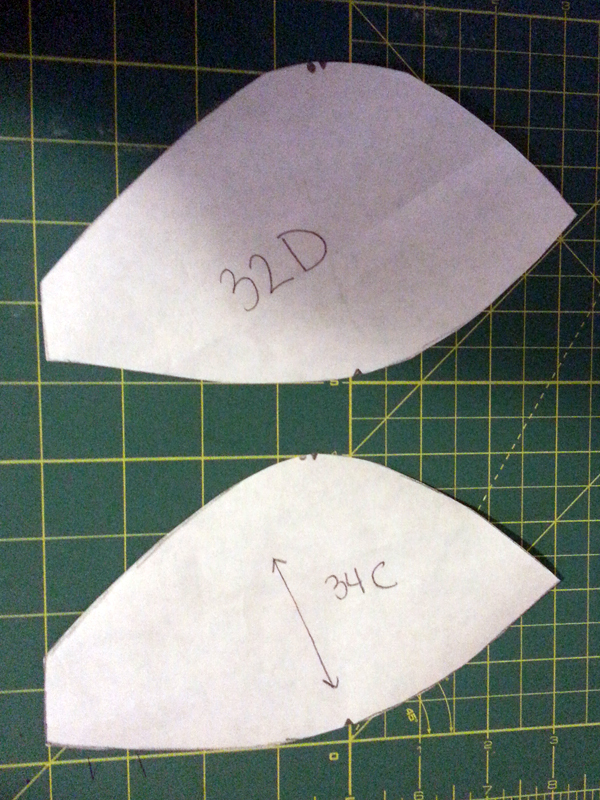 As you can see, the 34D is larger than the 32D, in both volume and length. 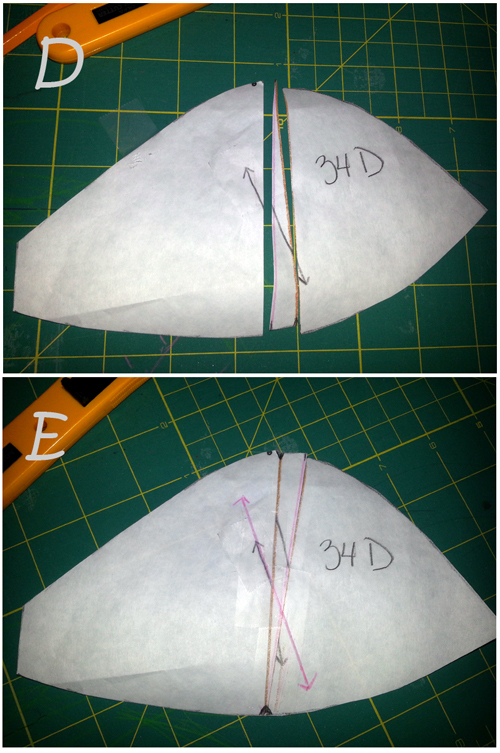 I needed a way to shorten the bottom seam to match the 32D since I was putting a 34D cup into a bra cradle meant for a 32D; and I needed a way to shorten the seam while maintaining volume. A) I drew a line from the arrow on top of the piece to the bottom using a ruler; I figured this was a good point of reference. Then I used my cutting mat, rotary blade and ruler and carefully cut across the line. B) I then took the 32D piece, and taped it down, and then I took the 34D cup pieces and carefully lined them up on the bottom seam as closely as I could; I then marked it on the left cup to indicate where the pieces overlapped. You would assume that I would stop here and tape the pieces down and go from there.. but there’s a loss of volume which is kind of not what I need to do; and it rather defeats the purpose of this alteration in the first place. C) I removed the 32D piece and then I carefully drew another line from the mark I made to the arrow where I did the first line, and again used my tools to cut a straight line. I don’t think it really matters if you do this with the left or right portion of the cup; since I’m left handed, I found doing this on the left side was easier. D) Here are all three pieces; I just lined them up and took a picture to show you what it looks like after cutting. E) I may have used excessive pieces of tape here, but I turned the triangular piece at 180 degrees, and then carefully lined it up to the left piece and taped it down. Then, I took the right portion of the cup and carefully lined that up and then taped it down. After it was taped together, I used my ruler and lined it up with the grainline, and extended the line just to extend across the adjusted cup. 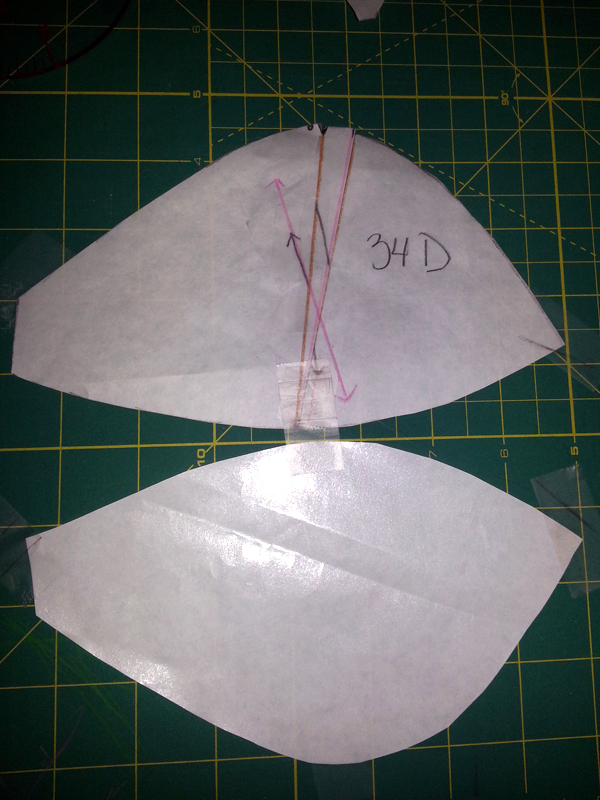 Altered 34D compared to the 32D; flipped over the piece to mirror the pieces. Here it is compared to the 32D cup! The bottom seam is much closer in length when viewed like this. It looks a little off due to slope of the bottom of the pattern piece. I was concerned about it not being right, so I took a piece of string and carefully traced around the cup and measured the string, and guess what? It was the exact same length! Success! I wanted to make sure it was going to work, so I also cut additional pieces -the bra pattern has a total of 4 pieces (cut two of 3 of the pieces just to get two of each as needed) and so I used scrap cotton fabric, and cut the cradle/band pieces out sewed those together to complete the band, and then sewed this test cup into the band and then hand basted the underwire into it. Center, side and front snapshot of the cup. As it is, I need to make some minor adjustments; I offset the cups by accident which is causing a bit of the cup on the side to be slightly taller in the band, and it’s slightly lower in the front. Overall though it fits perfectly which is what I’m the most excited about. Despite the fact this is not a wearable muslin (since it’s entirely made out of quilting fabric and not the stretch fabric it needs to be for the bra and the fact that I did not alter the top piece of the cup and it still matched perfectly) I think it came out pretty well! The excessive wrinkling in the cup is due to the fact that Greta is not quite as well endowed as I am, and I had to empty out the left cup to get the bra to lay relatively flat for pictures. 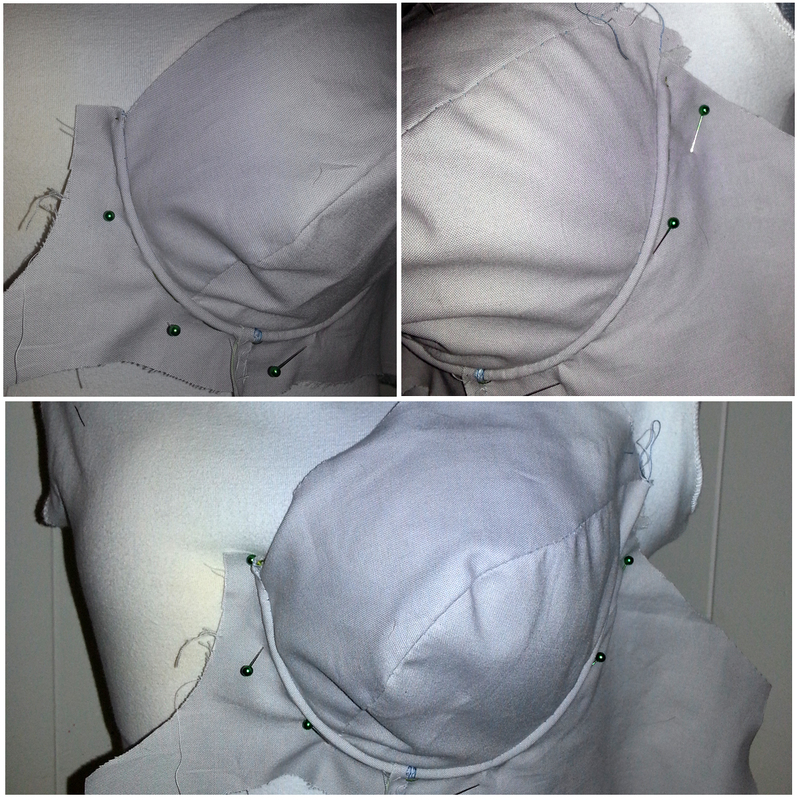 I think by altering the pattern before sewing the cup together allows me to have a much smoother and pretty looking bra, versus sewing the darts into the cups after cutting and sewing the pieces together. I don’t go around in public flashing my bra at people, but I think knowing that I’m wearing a pretty piece of lingerie that I made gives me that boost confidence and pep that a well fitting pretty bra can give a woman. I want to make note that I will probably have to bring in the curve of the cup; I actually fall between cup sizes. (although much closer to the 590cc end of the fit) If I size down I end up overflowing the cup a bit. It’s always best to have a little too much room in the cup, versus not enough; and especially if you still get that fantastic monthly visitor; you may find that the little extra room gets filled during that particular time of the month. But because of this my commercially purchased bras DO gape just a bit, but not so much they aren’t supportive. It’s not even noticeable when I wear tight clothing, but the fact they do that does bug me a bit. So yeah, there’s that! Hopefully this tutorial gives some readers some insight on bra construction, and maybe you’ll find yourself needing to do the same kind of alterations that I did; and I hope that the steps were detailed enough! Feel free to let me know if you need any more details on a specific step or if you just have questions. Previous Post Previous post: Hello 2013! Next Post Next post: Bra Making Complete!